Excitement! Time to introduce a brand new lunch box! I love my To-Go Ware tiffins and use them almost every day to pack our lunches for work, but lately I've been packing more hot foods like soups and stews. The tiffins are perfect for big salads and cold foods, but now I wanted something with a tight lid that wouldn't leak that would keep my food warm until lunch time -- something like the wide-mouth insulated container I bought a couple years ago, but a bit larger and made from stainless steel. I found one! And with a cute green apple handle, too! 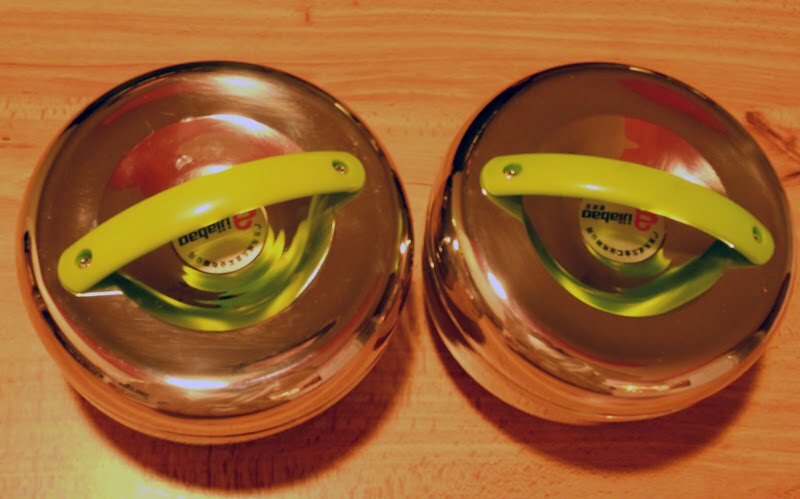 I ordered our two new thermal stainless steel double-walled lunch boxes just a couple weeks ago from Dino Direct, but they aren't on their website at the moment. This one looks similar. 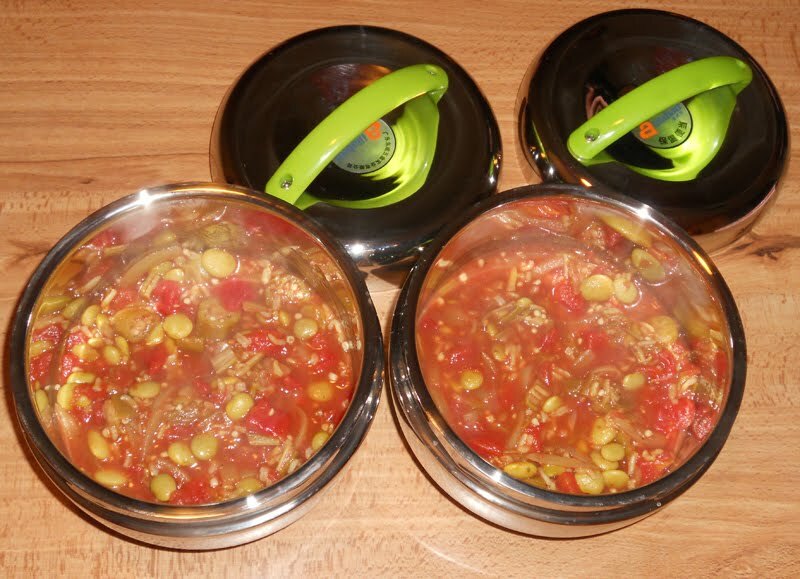 For their inaugural voyage to lunchtime I filled them both with Okra and Lima Bean Masala from FatFree Vegan Kitchen. This is one of my favorites to make at the end of the week when fresh produce is running short but I'm not ready to go to the grocery store; I steam-saute a sliced onion with Indian spices, then add a bag of frozen okra, some frozen lima beans, and two cans of diced tomatoes. That recipe sounds amazing, I know what I'm making for dinner tomorrow! Horrible confession time - I am thoroughly intimidated by okra. I think I was 15 before I even saw the stuff, and then it was breaded and deep fried and therefore didn't make a very positive impression. I adore masala though, so maybe this would be a good place to start. The new lunchboxes look great! I love my thermos, but I wish it held a bit more sometimes. Was wondering whatever happened to Schmoo? Never hear about him anymore. I've just made okra for the first time today = already addicted. Next time (Saturday I guess) I'll try this one. Hi Jen! I just hopped over to the Dino Direct site to check out that cool lunchbox, and I think I saw the one you have. But I was taken back a bit by the price! Did you really spend $400 on two lunchboxes?! They are listed as "on sale" now for $124! Sale?! I see the one that your link goes to, and it's on sale for about $12. What's the difference? I really want one, but I can't afford a $100 lunchbox. I know, it's bizarre! No way would I ever spend that much on a lunch box! They were $34 w/free shipping when I bought them a few weeks ago. I have no idea why they are asking for over a hundred now -- too weird! I don't see much difference between the ones I bought and the $12, they are just a little smaller. Thank you so much for the new info on okra!, i've been adding them to my green smoothies since reading this post and can't wait to use this recipe. Your recipe looks sensational! I was also considering getting the tiffins. Are the microwaveable? No, the tiffins are stainless steel, so they are not microwaveable. I am a personal trainer and writer and am in the process of completing the editing phase of my first book. A vegan client of mine suggested I contact you to see if I could hear your story and perhaps get some direction for my own efforts. The name of my book is The Zen of Weight Loss and I hope we can talk about it more. I write an advice column, "Table Manners," for CHOW, the online food and drink mag, and would love to interview you for this week's column, which is about sending your kids to school with an unusual lunch and how to help them deal with possible teasing by their peers. Thanks and looking forward to speaking. This is a brand new Vegan book I think you'd really enjoy. Love your blog! I checked Dino Direct as well and was taken aback by the price they asked for this lunchbox. Then I checked again a few days ago and found that it is currently being sold for USD 32.25, which is much more reasonable! I had already ordered an alternative but contacted them to cancel that order and substitute it with this item, so I hope to receive mine soon. I have a Mr Zojirushi thermal lunchjar with 4 boxes that I'm very happy with, but this is great when you only want to bring 1 warm dish for lunch. Insulated tiffins?? YEAH!! Love these for their ease of travel, storage, and super quick to clean. I web surfed into your blog from a google search of "vegan blogs." This blog looks great. I am already taking your advice and buying the To-Go Ware tiffins! Is it because i am using my phone that i dont see the recipe??? I love your website! I was wondering about the insulated tiffins...do you think they hold the heat well? My daughter is going off to kindergarten in the fall and I'm looking at all the options out there. Some of the thermos style containers are just too narrow for some of the foods she likes to eat and think these tiffins mint be just the thing! Tha ks! I have one and it holds heat well, it's a good size for a kid's lunch, and it would be easier for a young child to carry. Okra! XD My mum got confused at what okra was when I bought some, and then I made fried okra and stirfried okra and she likes it now. O_O but she still doesn't know what it is. So glad your blog came up in my search for vegan kids lunches! I just ordered two tiffin type lunch boxes from one of your links! Have been looking for affordable ones for a while! PS - everything you show looks sooooooo yummy! Do the tiffins really keep food hot? Such as soup? And it's not $100 but $28 for 3 as someone who commented earlier had found. Maybe there was a glitch on the Dino site? Recipe sounds great!! I also wanted to lick the screen as I'm on day 22 of my 30-40 juice cleanse. 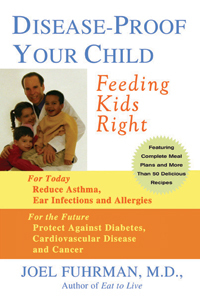 Always looking for inspiration for meals to fix my family. Thank you! !